It’s Jameson Raid’s first release of all-new material since ‘The Hypnotist’ EP back in 1980. It features original frontman Terry Dark and ‘second generation’ bassist Pete Green aided and abetted by guitarist Kalli Kaldschmidt and drummer Neudi from NWOBHM coverists Roxxcalibur which is a great partnership in any book. 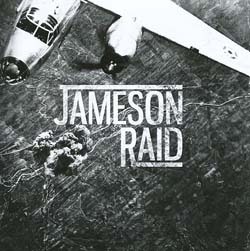 This collaboration of originators and enthusiasts and the overall production has created a modern spin on the still recognisable Jameson Raid sound. ‘I’m Not Waiting For You’ is a frenetic work-out slightly reminiscent of Mythra’s ‘Killers’ and all the better for it. ‘Nine Reasons’ is a scathing indictment of humanity, set to a catchy head-shaker which has already proved its worth in the live set. And the guitar solo is a blaze of fury and as exciting as it comes. ‘I’m Not Crazy’ starts as a slower set-piece but then flexes its muscles and tailspins off into Maiden-esque fury. Terry Dark still has a wondrous imagination when it comes to crafting lyrics. This particular line-up has now called it a day so it’s the only chance you’ll have to see what Dark/Green/Kaldschmidt/Neudi had to offer. Because deep down inside you know you want to.